When the city’s game of thrones concludes this March, one victorious mayoral candidate will claim Los Angeles City Hall as his or her castle. Though the throne may be as enviable as ever, the castle itself is a prize that has diminished somewhat since the mid-twentieth century, when for 40 years the building reigned as the city’s tallest, its white, obelisk-capped tower commanding the Los Angeles skyline. 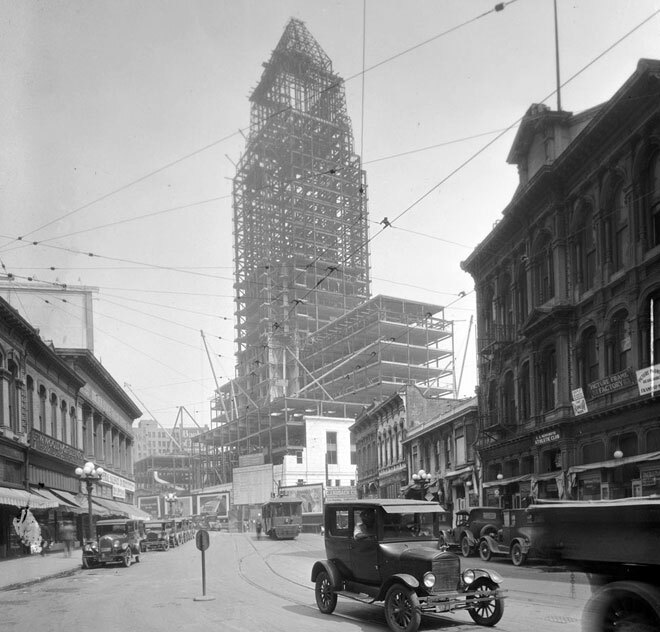 The building—pictured here in skeletal form in 1927—was the fourth to be called L.A.’s city hall. The first, a simple adobe structure, dated from the city’s days as a frontier town. Its portico doubled as a gallows. Built in 1884 at the cusp of a major land boom, L.A.’s second city hall lasted only four years at the northwest corner of Second and Spring before rising property values became too enticing; the city council sold the land on which City Hall sat for a tidy 287-percent profit in 1887. The following year, Los Angeles erected its third city hall at the corner of Second and Broadway. Built in the Romanesque style, the building featured a campanile that soared nine stories above the horse traffic below. For its fourth and current City Hall, built in the 1920s, Los Angeles opted for a bold structure that would announce its arrival as a major metropolis. The city commissioned a blue-ribbon panel of architects and made an exception—one that required action by the state supreme court—to the city’s own self-imposed 13-story height ceiling limit. On April 26, 1928, after two years of work that cost $4.8 million, the revolving Lindberg Beacon blinked on some 464 feet above Main Street below, signaling City Hall’s completion. The structure rose 32 stories, far above the city’s flat-topped skyline, and would remain L.A.’s tallest until 1968.